Here's a great look, with old film footage of the 1929 U.S. Amateur, of Amateur golf's history at Pebble Beach where stroke play qualifying begins Monday. This photo gallery of 1929 is a real keeper. And as John Fischer reminds us, Bobby Jones losing early in match play led to golf at Cypress Point and Pasatiempo, and an affinity for Alister MacKenzie's work. As for 2018, Golfweek offers this look at players to watch. Here is Amateurgolf.com's list of players they're watching. Brian DePasquale's USGA.org full breakdown of the field. You can follow scoring at USGA.org. And their page devoted to event schedule and Fox television times. Jack Nicklaus, whose son Gary qualified as a reinstated amateur, attended the event dinner Saturday and posed with some current Buckeyes. Nicklaus won the 1961 U.S. Amateur at Pebble Beach. As the restoration movement continues to reinvigorate tired properties, the power and clarity delivered by a master plan document is often forgotten as the long term key to a healthy design. Understandably, the excitement over better playing and looking golf holes becomes the focus after a restoration. But these projects almost never commenced without a document evaluating the original design’s evolution or the changes necessary to improve things. They also provide a fine opportunity for vital “under-the-hood” improvements required to carry a course into the future. Countless classics were guided by these documents and now swear by them, sometimes religiously clinging to the plan without some wiggle room to make modifications. But given the history of green committees, ironclad plans prove wiser than leaving leeway for amateur architects to leave their mark. The latest addition to Pebble Beach demonstrates, in glaring fashion, the danger of not having a master plan or a genuine grasp of the architectural high-point of a course. The planting of South African gazanias on one of golf’s most beautiful locales needing no help suggests it is time for America’s national golfing treasure to commission a serious master plan. To not recognize the architectural and landscape malpractice suggests either too many or not enough cooks are in the Pebble Beach kitchen. There really is no shame in having reached this point, as most of the best courses in the world were driven to consider their design past and future after some sort of gaffe. Nearly in every case it was not a general realization of architectural decline, but instead something as gaudy as a goofy gazania bed. Taking a hard look at Pebble Beach’s design evolution and targeting the course at its peak would help the famed resort understand priorities in aesthetics, strategy and playability. There has been a sense that doing so would damage the grand story of amateurs Jack Neville and Douglas Grant, commissioned by Samuel Morse and concocting the masterpiece we know today. Their masterful routing will always be integral to the Pebble Beach story, however, design trends evolved over the decade following their effort and the course ultimately came together with touches from Herbert Fowler, Alister MacKenzie, and then most significantly, thanks to Chandler Egan and Robert Hunter's pre-1929 U.S. Amateur remodel. Egan reached the semi-finals of that amateur and is one of America's greatest amateur golfers. A study of that 1929 effort would show larger and more intricate green shapes and a better attempt at injecting a sense of naturalness on a magnificent site plagued in early days by geometric and unsightly features. 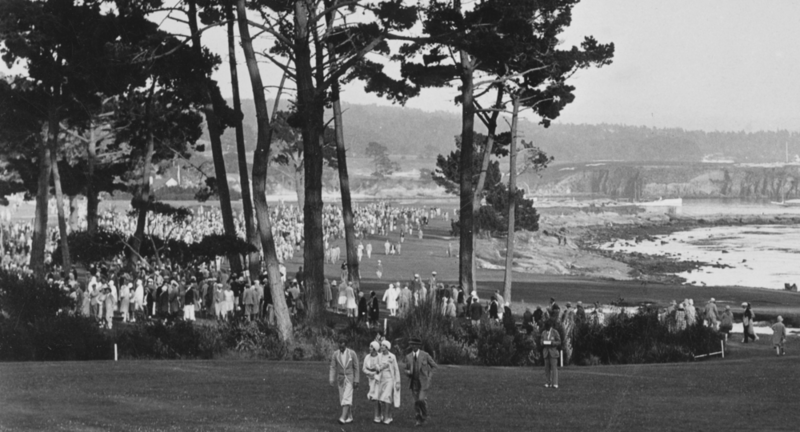 The old images below validate the unique qualities of the 1929 version and while the current ownership of Pebble Beach has taken the resort from hard times to grand stewardship, the golf course vision has fallen behind the clarity they've shown in maintaining the overall Pebble Beach community. It's time for the resort to consider restoration professionals who can identify the best features, understand how the course has evolved, and steer Pebble Beach in a direction that best embodies the course at its peak. Given the importance of the course, perhaps even a bake-off style process open to many architects will provide even more clarity. From a strictly business perspective, I suspect such a plan would right the rankings ship, which has seen Pebble Beach slipping in all of the major magazine rankings. While this amazing place is not in danger of failing just because magazine panelists are giving lower golf course grades, they are sending a message: Pebble Beach is not as good as it should be. As I argued this week on Golf Central, the design is actually underrated and should be the undisputed No. 1 course in America. Currently, it is not, and a bed of gazanias won't help make golf's most beautiful setting any prettier. The flower bed merely highlights the need to commission a master plan. Terrible news out of Pebble Beach where R.J. Harper, executive vice president of golf and retail operations and the face of operations there since rising from the ranks of golf course marshal, died Wednesday of pancreatic cancer. He rose through the ranks during his 32-year career at Pebble Beach Co., becoming the head professional, serving as championship director at the 2000 U.S. Open and general chairman of the 2010 and 2019 U.S. Opens at Pebble Beach before earning his executive position. Alan Shipnuck at Golf.com posted this profile of Harper in February this year that is worth a few minutes of your time if you did not read it then. He is a classic American success story, having begun his career at Pebble as a $5-an-hour marshal before working his way up to head pro and now a senior executive position at the Pebble Beach Co. Oozing the Southern charm of a down-home Tennessee boy and possessing the swagger of the football star he once was, Harper has the rare ability to befriend everyone from resort guests to PGA Tour stars, greenskeepers to captains of industry. In his three decades at Pebble he has become one of the most-connected men on the planet. Steve Hennessey at Golf World with a roundup of Tweets from across the golf world expressing sadness at his passing. I'll add more remembrances as they are posted. RJ Harper has been a friend to Barbara and me, a friend to the game of golf, and a friend to #PebbleBeach for many years. He has been an institution on the Monterey Peninsula. We all knew that he wasn't well, but with a spirit typical of RJ, he fought long and hard in a very difficult battle with pancreatic cancer. Last time I saw him was in June at The Calling, Jim Nantz’s event at Pebble Beach, and RJ was doing well. While he knew that his time was limited, you would never know it by being with him. As always, RJ had a smile on his face the entire time. RJ was a great guy and we are going to miss him. It will be hard for all of his friends to walk into Pebble Beach and not see his smiling, friendly face. Barbara and I send our love and prayers to his family during this difficult time. We all lost a great friend. Beloved figure at Pebble Beach GL R.J. Harper has lost his courageous battle w cancer. His loss so far beyond the game. As nice & caring a human being I’ve ever met. God bless his family. Pebble Beach's 14th Well Received, But Is This Progress? After reading Alex Miceli's Morning Read take on the early reviews of Pebble Beach's revamped 14th green, I'm glad to hear that the hole is no longer controversial. However, Miceli's image and description of a restoration focused on Douglas Grant and Jack Neville's 1919 green instead of the once-brilliant Chandler Egan green created 9 years later and lasting until recently, suggests a serious setback for efforts to preserve Egan's brilliant pre-1929 U.S. Amateur renovation. Yes, the Egan green had become too severe for today's speeds, but the front hole location has been usable in my lifetime and it was fun when Stimp speeds were in the 8's and 9's. The remarkably cool Egan tier should also have been preserved in some way for historical accuracy and better variety of hole location looks. The renovation, which began after last year’s Tour event, used early 20th-century photographs of the Jack Neville-Douglas Grant design to help capture the historic contour of the greens. Architects took advantage of modern technology to improve playability of the hole. Among the changes: the green meets USGA specifications, a SubAir moisture-management system was installed and bunkers were renovated. Miceli notes that the early scoring average was well below par and the 14th was playing as the second easiest. "Meet the environmentally conscious teens cleaning up the Pebble coastline"
It was one of my favorite stories in some time and now budding marine biologists Alex Weber and Jack Johnston get the full SI-style profile treatment from Alan Shipnuck, complete with Robert Beck photos and a nine-minute film. Shipnuck addresses many questions about the kids cleaning up the cove off Pebble Beach Golf Links, including the toughness required to dive and dig up the golf balls. When Alex first came upon the balls during a recreational dive with her father in September 2015, she had no idea these man-made pearls would consume her life. "There wasn't this big master plan," she says. "I just knew they didn't belong in the ocean, and I wanted to get them out." In the ensuing dives her father was a constant—Mike owns a chicken ranch that produces 150 million cage-free, organic and kosher eggs a year—but while various friends of Alex's tagged along once or twice, only Jack kept coming back. It is grueling work that begins with hauling the kayaks down the steep sand hill at Carmel Beach, followed by the long paddle across the bay through strong winds and tides, and then hours of diving in frigid water that always leaves their lips blue, despite thick wet suits, hoods, gloves and booties. After all that, they have to schlep hundreds of balls and their gear back up the hill to their cars. The balls are stored in the Webers' garage, and some stink—a sulfuric, chemical smell that is a hint of the toxins they may be releasing into the sea. As the collection became more numerous (and malodorous), Alex and Jack were galvanized to take the fight public. "It became pretty obvious this issue was bigger than us, and we had to go to people who could help us change things," Jack says. I gladly made a donation to their GoFund me page and notice it still could use some help to their $10,000 goal as they get ready to further their education! KSBW's Caitlin Conrad highlights the great work done by two Monterey area high school students and outdoor enthusiasts who discovered how many golf balls are polluting the Carmel Bay sea floor, including rubber-core balls dating back to the 1980s. 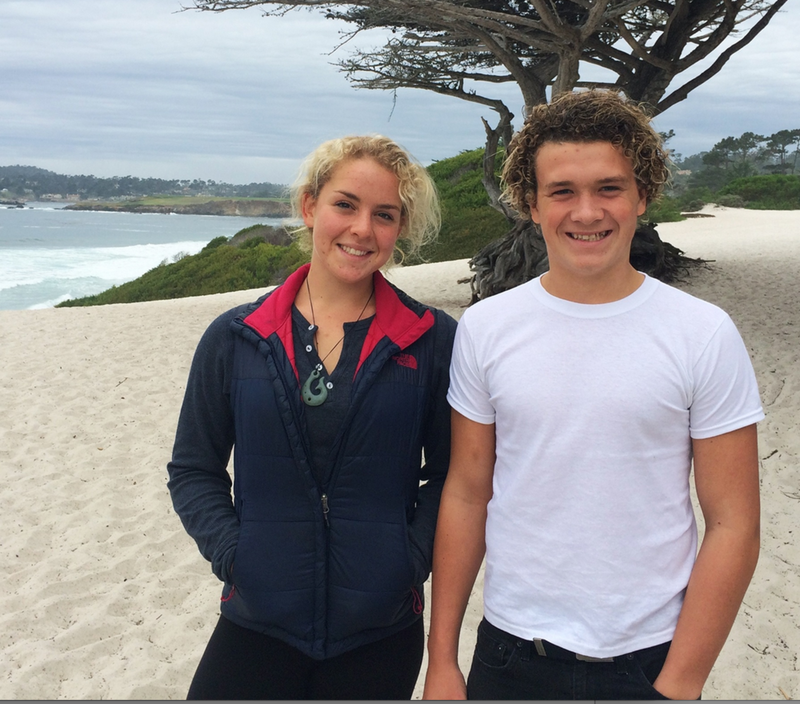 When presented with the findings by Alex Weber and Jack Johnston, the Pebble Beach Company responded in fine fashion, with plans to be more aggressive with sea floor clean up and making a contribution to help the two students further their marine science education. Mathes said Pebble Beach Company was unaware of the pile up in the cove until the teens brought it to their attention. “You know we’ve had decades of scientific researchers, recreational divers out off the coast and no one has brought this to our attention, it’s really these two students who have discovered something, and we are really quite proud of them,” Mathes said. Weber said Pebble Beach Company is doing a good job stepping-up to the task of removing the balls but she said she was surprised no one knew about the problem earlier. “It is almost common sense, like you should understand that if you’re hitting a golf ball off a cliff into the ocean, it’s going to end up under the water,” she said. The Pebble Beach Company gave each of the students $500 scholarships to The Island School, a high-school marine science and sustainability-based study abroad program in the Bahamas. They are funding the rest through this GoFundMe page. Their video showing the Pacific floor next to the course. Warning, it's disturbing! 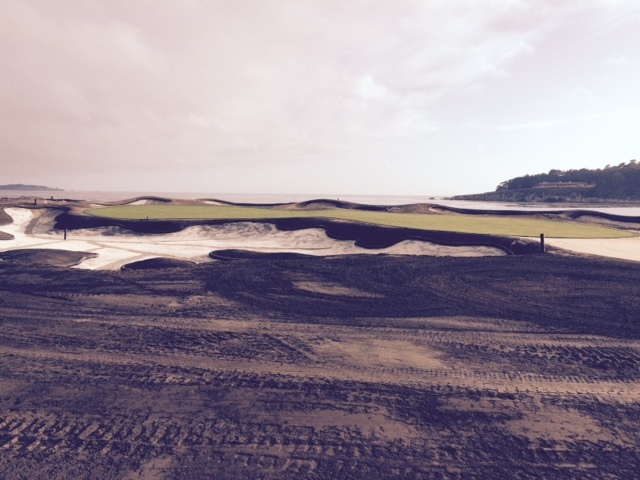 John Strege reports that the long-anticipated but much-delayed restoration of Pebble Beach's 14th green is underway. The scene of some memorable boondoggles in recent years, Chandler Egan's marvelous two-tiered green had become too severe with modern green speeds, rendering the front portion unusable for nearly two decades. That will be changing with a move to 4,000 square feet of surface instead of the current, gulp, 3,200. Maintaining the original concept of the green seems to be the priority, reports Strege after talking to R.J. Harper. "Through a collection of all the photos, we landed on something we think is the right way. We’re increasing it to the original size and we’re going to keep the general shape to the green. The big cavernous bunker remains, but we’re lowering the top lip that if your ball came down there it would shoot it to the back of the green. We're leveling off the upper part of the green, increasing square footing by going back, and recreateing the pin location back right that no longer had been available to us." Nice work by Dave Shedloski to tell the story of Chandler Egan's medals having been found by his family and handed over to the USGA for display in Far Hills and the U.S. Open, before moving on to the World Golf Hall of Fame. Longtime readers know about Egan, the actual architect of Pebble Beach as we know it who, for mysterious reasons, is ignored by historians who apparently aren't as enchanted with his story as they are with the Neville/Grant/amateurs-make-good story. But Egan's life in golf was pretty impressive: Harvard man, Olympic medalist, U.S. Amateur champion, NCAA individual champion (and three time team winner), golf architect, beloved friend of Bobby Jones, etc. Until a year ago historians believed that none of the individual medals from the golf competition in the 1904 Olympics at Glen Echo Country Club in St. Louis still existed. That changed when the silver medal of H. Chandler Egan, former U.S. Amateur champion, was discovered (along with his team gold medal) in the bottom of a bookcase in the former home of Egan’s daughter in Chagrin Falls, Ohio, about 25 miles southeast of Cleveland. Buddies Tournament! Celebs Dragging Name Pros To Pebble? It's still a tad early to declare the AT&T Pebble Beach National Pro-Am field the best ever (the tournament director is), but the improvement is already noticeable. Celebrity impact: Watson will play for the first time since 2007 because one of his good friends, actor/producer Mark Wahlberg, is playing. That prompted Watson to request a pairing with Wahlberg. Done. Similarly, soon after American League MVP Josh Donaldson signed up, fellow Alabaman Jason Dufner, the 2013 PGA Championship winner, hopped aboard. Steve Stricker, a 12-time tour winner, will make his first appearance in 10 years — because he wants to play with country singer Toby Keith, a friend. “It’s kind of turned into a buddy tournament,” John said. Ok, before you balk at the $27 million someone paid for the 4-bedroom house behind No. 10 green at Pebble Beach Golf Links, check out the slideshow from Architectural Digest (thanks reader Tim). 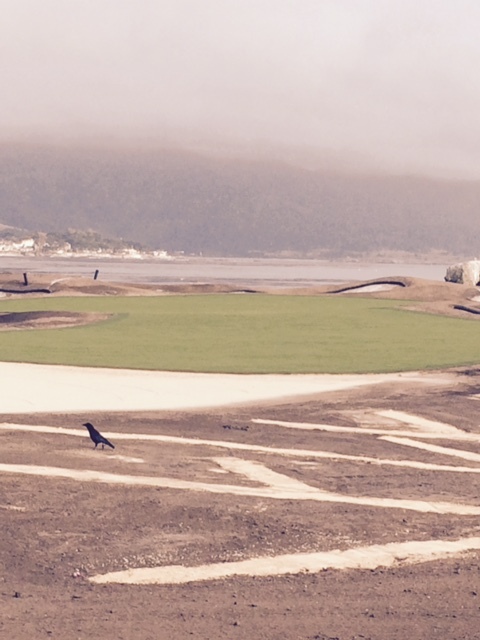 Thanks to reader Jay for these photos of the revamped 17th at Pebble Beach under construction/grow in. The green has been sodded, in case you were wondering. The reclaimed square footage and basic bunker shapes look excellent. The final details remain TBD. Plenty of drainage in the approach! **I finally found the side view from the old days and compared to today's NCGA image, it would appear the green will be more hourlass than in the original Chandler Egan design, which I wrote about in Golf World. John Strege with the lowdown on the small cypress tree that went down at Pebble Beach's iconic finishing hole. The tree was one of two planted down the fairway in 2004 when two trees on 18 were diseased and also out of play due to the elite, Olympic-caliber athletes now playing the game, unlike in the past. One of the two cypress trees in the landing area of the 18th fairway at Pebble Beach Golf Links was toppled Thursday by strong winds that were a part of what the National Weather Service predicted would be one of Northern California’s strongest storms in years. The photo below, a screenshot taken during the storm from Pebble Beach’s Live Cam looking down the 18th fairway, shows the downed tree in the upper left-hand corner. In a later post Strege reports that winter conditions will preclude a replacement tree prior to the AT&T National Pro-Am and also features a close up photo of the downed tree.